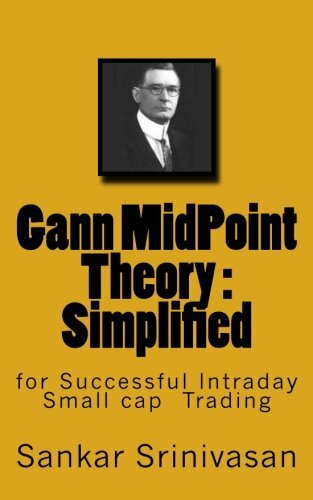 READ THIS BEFORE BUYING This book GANN MIDPOINT THEORY : SIMPLIFIED is a simple explanation of William D. Gann's mathematical calculations and its adoptability in modern day online trading. I have simplified and explained the calculation with few examples. Read it and mail me with proof of this purchase, and get excel sheet with ready made calculations, to take immediate decisions. It is ideal tool for INTRADAY SMALL CAP SHARE TRADING. Designed exclusively for new comers. Practice in paper trade for a month, for better understanding. Sankar Srinivasan is from Madurai City, Tamil Nadu, India. He is having more than 10 years of experience in Technical Analysis and Online Trading. He is conducting Technical Analysis and GANN Theory Classes for Online trading customers. He is heading a sub-brokership for Indian Stock Trading, and providing technical guidance to lot of Stock, Commodity and Forex Traders in India. Moreover, He is a National Stock Exchange of India's Certified Market Professional.